Our patients live in Newberry County, SC. The Free Clinic has guidelines to determine eligibility on the basis of household size and household income as a percentage of the Federal Poverty Level [more]. Our patients have no access to medical insurance, as they are not elgible for government programs and cannot afford commercial health insurance. 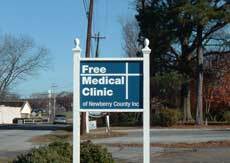 The Free Clinic is located at 2568 Kinard Street in Newberry, SC, directly across from Newberry County Memorial Hospital. The clinic is closed Sunday and Saturday. How Is the Clinic Staffed? The Free Clinic is staffed by volunteer health professionals (physicians, dentist, nurses) and other support personnel [more]. These volunteers give generously of their time and professional expertise to help their friends and neighbors in Newberry County. The formation of a free medical clinic in Newberry was spearheaded by Bobby Summer, Dr. Gene Epting, and a diverse county-wide organizing committee. Guidance and assistance for this undertaking was provided by the Volunteers in Medicine, the South Carolina Hospital Association, and the South Carolina Free Medical Clinic Association. The Free Clinic is a 501(c)3 non-profit organization. Cash and in-kind contributions are tax deductible under IRS regulations.